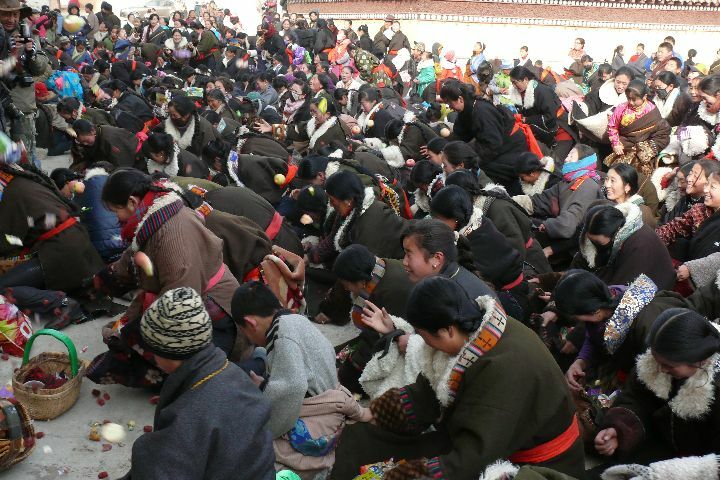 The Butter Tea Ceremony is a very special event in the lives of some Tibetan communities. 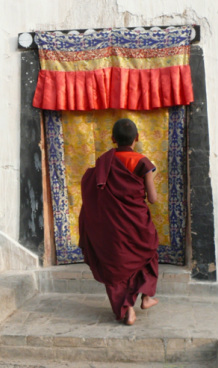 The ceremony is performed during the early days of Monlam, usually in concert with some other event such as Displaying the Tangka or the Maitreya Transportation. 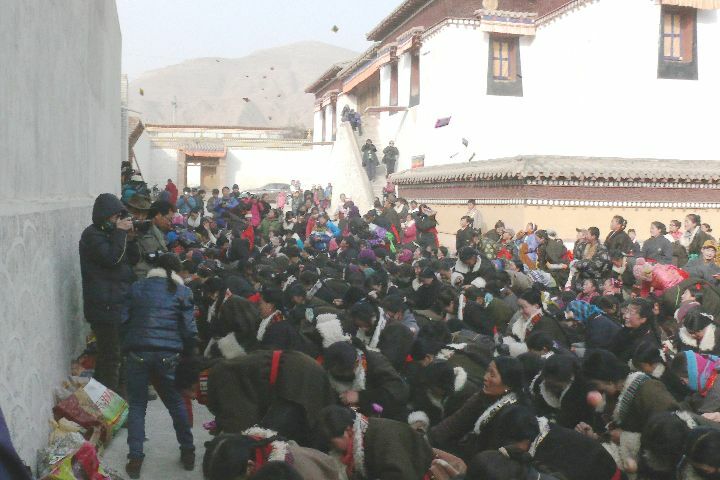 This ceremony is rarely practiced any more, and it seems that Gomar Gompa (where these photos were taken) is the only place in eastern Amdo where it can be seen. 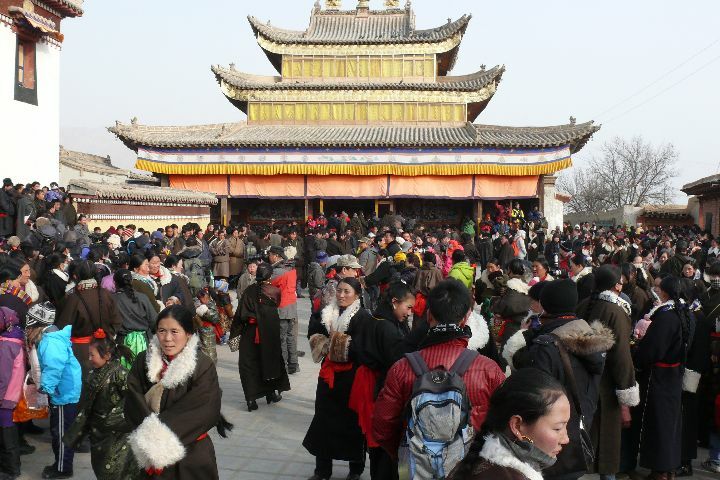 Early in the morning, the local community start to make their way into the courtyard in front of the Chanting Hall. The women bring their children and visit with others, many that they have not seen for some time, in the normal tradition of greetings for the New Year. The men also gather, but separately in their own part of the courtyard. Barley flour bread to be taken into the courtyard. 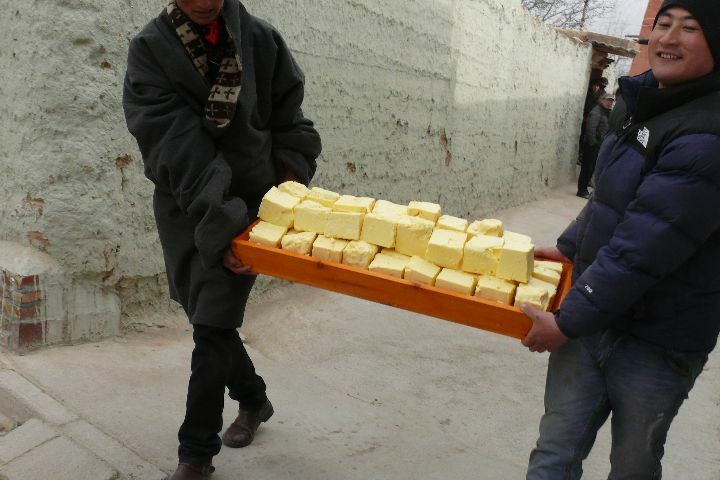 Yak butter for the tea. The final moments of brewing and pouring. Bread is also required to dip / dunk into the tea and in this manner provide some energy for the morning's activities shortly to follow. 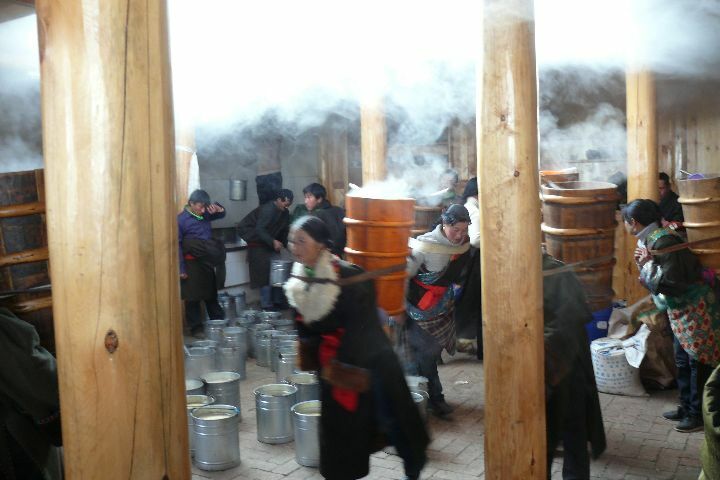 Butter tea holders are readied while the final preparation of the butter tea is completed in cauldrons within the misty confines of the kitchen. The tea has been made by boiling tea leaves in water for several hours until they are dark brown in color. The concentrate is then mixed with salt and fresh yak butter and stirred. Once this has been done, the butter tea is ready! 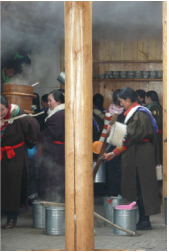 The women collect the steaming hot butter tea in traditional wooden buckets carried on the back or in more modern aluminum pails carried on a stick across the shoulders. and delivered to their elders. Note the bare feet ! The boys with their bags arrive. 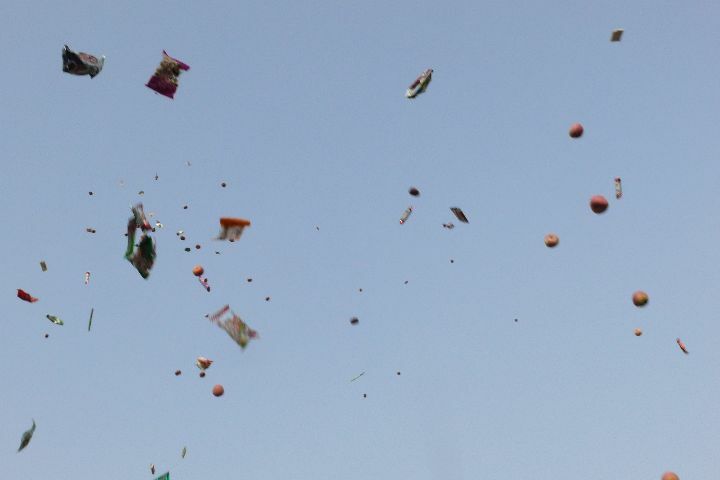 Fruit and candies take flight. Catching goodies in their aprons and bags. The main ingredient of butter tea is butter. 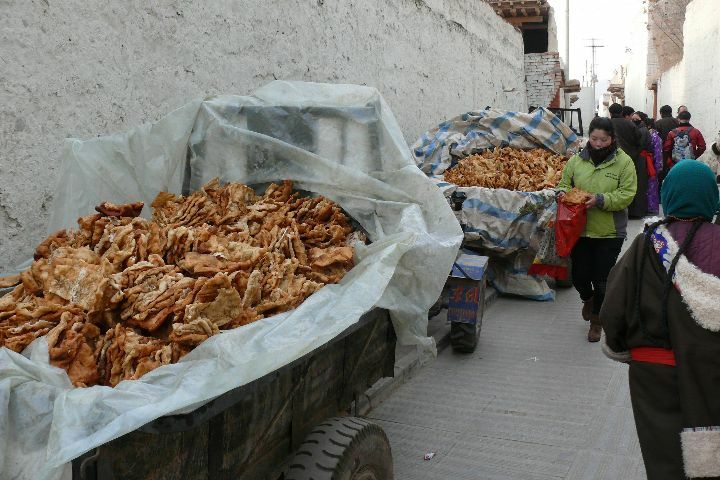 Thus the tea has plenty of caloric energy and is well suited for the higher altitudes of Tibet. Some say that butter tea can also help prevent chapped lips. The tea is delivered to mothers and their children. 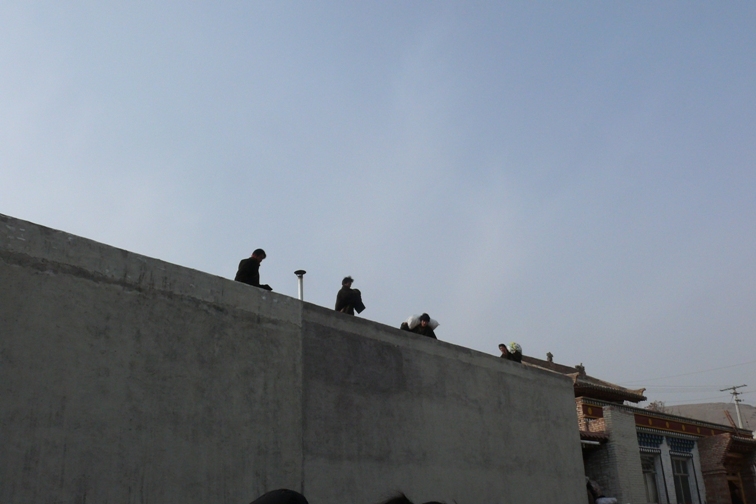 The wooden buckets are placed on the ground and the tea is ladled out into cups and mugs as required. 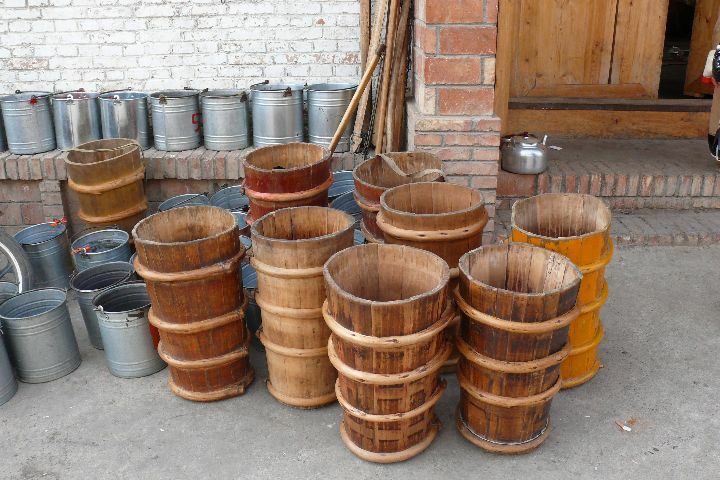 Each wooden bucket holds about 30 litres of tea. Children of all ages partake. Some bring their own flour to make sampa. The men also have tea but in their own lines. 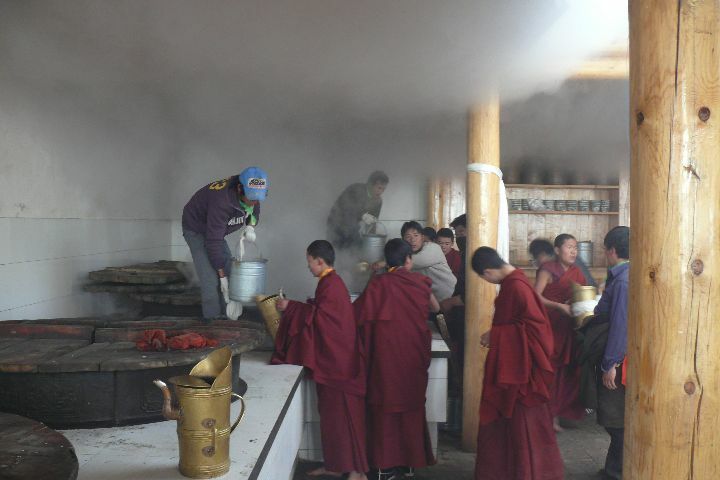 The Butter Tea Ceremony is not common and is practiced at a very small number of monasteries. 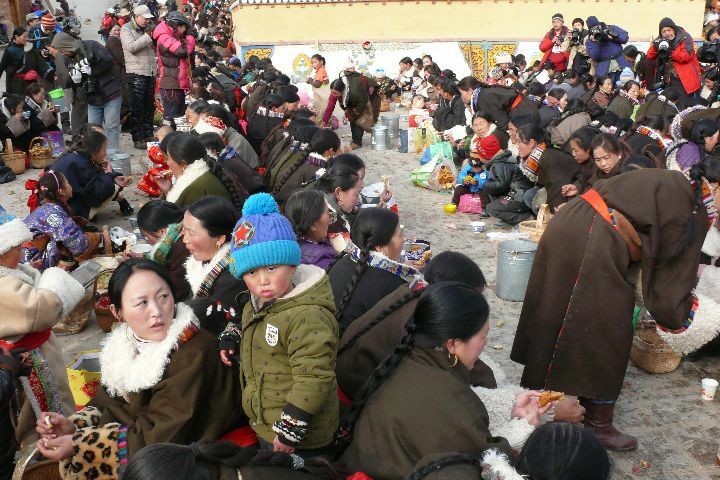 It is a strong reminder of the importance and cohesion of the local Tibetan community, as well as a demonstration of the monastery 'giving back' to those who give so generously to it during the entire year. Catching up - note the barley bags on the rim of the incense burner. Cleaning up for the afternoon activities.